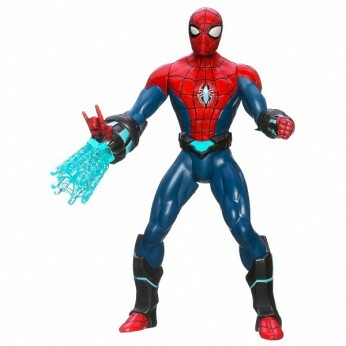 This 25cm electronic Spider-Man figure features an electro shock web gauntlet with electric sound and light effects. Also features Spider- Man’s iconic speech from animation. This toy costs approximately £19.99 (for the latest and best prices make sure you check our retailer list for the Speed Electro Web Spider-Man above). In our review of Speed Electro Web Spider-Man we classed it as being suitable for ages 4 years, 5 years, 6 years, 7 years, 8 years but recommend you check the manufacturer specific advice before purchasing.